The American Iron and Steel Institute (AISI) has published three new cold-formed steel framing research reports, each representing a portion of an overall project undertaken at McGill University to increase knowledge of the behavior of cold-formed steel to advance design efficiency and ensure safety. “RP17-4: Higher Strength Cold-Formed Steel Framed/Steel Shear Walls for Mid-Rise Construction” The objectives of this portion of the research project were to: 1) analyze the influence of the wall length for shear walls designed and built with quarter point frame blocking members, and 2) determine the influence of the framing thickness on the performance of the shear walls in order to bridge the gap between cold-formed steel and hot-rolled steel lateral framing shear wall systems. “RP17-5: Higher Capacity Cold-Formed Steel Sheathed and Framed Shear Walls for Mid-Rise Buildings, Part 1” The research resulted in the development of a design procedure for cold-formed steel sheathed and framed shear walls to achieve higher capacity and ductility to resist the higher forces experienced in mid-rise construction. The design procedure is proposed to be included in future provisions of AISI S240 and AISI S400. “RP17-6: Higher Capacity Cold-Formed Steel Sheathed and Framed Shear Walls for Mid-Rise Buildings, Part 2” Building on the results of RP17-5, this research resulted in a preliminary Limit States Design (LSD) procedure for Canada and Load and Resistance Factor Design (LRFD) procedure for the Unites States and Mexico for two innovative building configurations (double-sheathed and center-sheathed). Resistance factors and overstrength values were also provided. 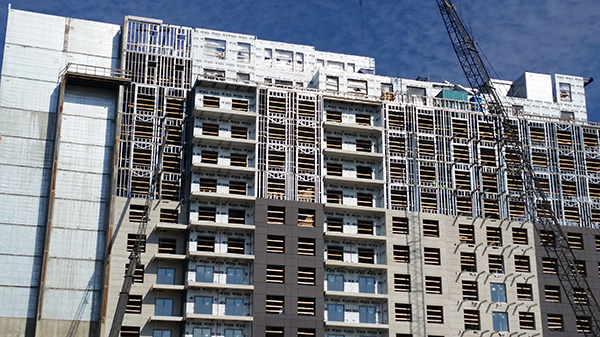 “The findings of this research are extremely encouraging towards the development of higher capacity steel sheet sheathed shear walls for mid-rise building construction, and the research team at McGill University should be commended for their efforts,” said Jay Larson, P.E., F.ASCE, managing director of AISI’s Construction Technical Program.